A drone purchased by the Loudoun County Sheriff's Department as part of it's Project Lifesaver Program played a huge role in locating a 92-year-old hunter who got lost in the woods in Shenandoah County. WASHINGTON — A 92-year-old hunter in Shenandoah County, Virginia who got lost in the woods last weekend is home thanks to a drone belonging to a D.C. area police department. On Saturday, a search was launched for William Luther McDonnell after he didn’t return home from hunting in the Laurel Run area of Shenandoah County. 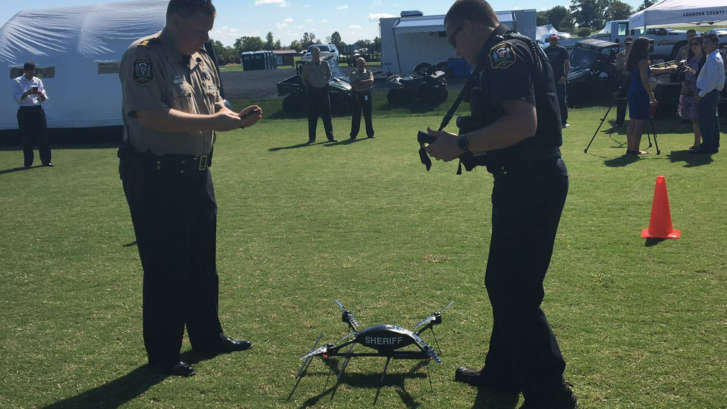 Several law enforcement agencies headed to the county to assist in the search, including the Loudoun County Sheriff’s Office, which deployed its new drone near where McDonnell went missing on Sunday. “We were able to launch the drone and within 20 minutes we got a visual sighting of the 92-year-old gentleman who was lost in the woods,” said Sheriff Mike Chapman with the Loudoun County Sheriff’s Office. Once spotted, rescue teams were able to get to McDonnell, who the Shenandoah sheriff’s department said was found in good condition. Chapman said this is the first success for the drone which was only added to the force back in September. It was purchased for the county’s Project Lifesaver program, an electronic-based tracking system that works to find people with medical conditions such as autism or Alzheimer’s who wander away from home. Chapman said this positive outcome shows how beneficial the unmanned air crafts are for finding other missing people as well. “What’s revolutionary about it is the fact that we can get an aerial view of different areas, close to the ground but up in the sky,” Chapman said. Chapman said drones also have an impact when it comes to the manpower needed for a search and rescue mission. “The drone drastically minimizes what we have to do with on-the-ground personnel,” Chapman said. Chapman said this drone isn’t like some you can buy at a store and has many features to aide in missions, including infrared video for finding someone during the night time hours. “It’s really kind of a terrific capability to have and it really gives us a leg up when it comes to trying [to] locate people who are lost out there,” he said.